Carports Gold Coast – Vehicle protection with a quality steel carport. Locally made steel Carports that will protect your car, boat or caravan for many year to come. If you live on the Gold Coast and you’re looking for a carport, Excalibur Steel Buildings can help you find the right one. You will receive a quality carport at a value price. It will stand the test time and add value to your property. Carports have proven to be one of the best projects you can do at your home. They not only protect your valuable cars, boat, caravan etc, but if done well, they also add great value to your home. A well designed carport that matches in with your house will always add value to it. If you are looking to sell your property, extra or initial undercover accommodation for your cars will bring extra money at the sale. The quickest and easiest way to do this is with a carport. Made to your size – There’s a very wide range of sizes to choose from, but if you need a different size, no problem, you can get that too. We can also cater for higher vehicles such as caravans and motorhomes. Only pay for what you need – Due to our national agreements with suppliers, we are able to supply you with carports that are cut to size. What this means is that you are only paying for what you need. 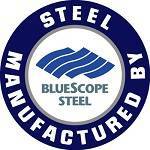 Australian made quality materials – We only use and recommend steel from Bluescope Lysaght. Designed, made and tested in Australian, you know it will withstand the Australian conditions and last. It’s also readily available for any future projects. Full range of Colorbond colours available – You have the choice of all the Colorbond colours as well as Zincalume, so you can match the carport in with the house and other buildings on your property. Matching the colours of the carport to your home and other buildings will give you the highest increase in value to your property. Site Specific Engineering Included – Engineering is included with all carports. It is site specific and suits the wind codes for your particular location. It complies with the relevant building standards and you can apply for council approval if needed. Complete Carports Supplied – When you receive your carport kit from us, it will include every part you need to build it. This means the posts, frame, roof sheets, flashings, guttering, downpipes and fasteners (nuts, bolts, screws, rivets). We are the experts in carport kits as well as diy kits for other steel structures. Q. I want to buy a carport – what do I need to know? 1. Find out what size will work for you. Virtually any sized carport is available from us. The space has to be first measured out to see what will fit on you block and more importantly will it fits your cars or boat or caravan etc. Also look to see if the ground is sloping or if it is flat, so that the right sized posts can be supplied to ensure a level carport. 2. Select a design – There are a few different carports to choose from (see below). A good option when picking the roof type for your carport is to first look at your house and see if you can get the same roof type to match both. 3. Find out what is allowed by the local Council. You can either contact the Gold Coast City Council direct, or call a private certifier to ask them. A private certifier is by far the most common route these days. They become the middle man and do the work on your behalf. 4. Get a quote and compare – not all carports are the same. Find out what you are getting for your money. If you are not sure about anything, call us on 5525 1111. We’d be happy to talk with you about your carport and find a solution. Once you have selected the right carport for you, it’s usually a matter of simply getting it approved by Council, and then ordering it. Once ordered, it will be delivered to your door several weeks later. With a steel branch at Tweed Heads, you’re also buying local and supporting local suppliers. It also means you have local support yourself. Q. Can I get my delivery direct to me in the local area? Delivery wise, we can service all areas of the Gold Coast including the Hinterland areas, as well as Tweed Heads. So if you want to buy a quality carport, give us a call today. We offer a free quote and design backed up by a quality product and service. Q. Are we able to come and talk with you about our requirements? Yes, you sure can. We can either meet you at your home, or simply pop in to our office and we can work out the best solution for your needs. Q. Do I actually need to apply for council approval for carports? In most cases, yes you do. As mentioned above a lot of people utilise a private certifier to do the council approval. They become a middle man if you like and this generally makes the process a lot easier and quicker. Q. What wind region are we in? The Gold Coast area is considered as wind region B or N3, but there are instances where this can possibly change. It depends on several factors – the geographic region, terrain category, topography, shielding from other structures etc. We can supply for all wind conditions, including region A, B, C, D, N2, N3, N4, C1, C2 and C3. With 3 generations of experience in the building industry, we can assist you in finding the best solution. You can also pop into the office. These are a premium solution in carports, for people looking to protect their cars and add value a good amount of value to their home. Available in a variety of sizes and heights to suit any vehicle including cars, boats and caravans. Options available: footing plates to fix onto existing concrete/footings. Similar to a Dutch Gable carport. Strongly designed and made to complement your home, especially if you have a hip type roof on your house. Comes in many sizes and heights. 2.4m to 3m in height and higher. as well any colour in the Colorbond range. These carports do the job of protecting your vehicles whilst also adding a bit of interest to your property. Choice of configuration and colours as well as other different choices. Roof Pitches: 10 degrees or 15 degrees as standard, 20 or 26 degrees on request. Gable Infills: Infills included as standard, open ends also available. Choice of profiles for Infill sheets – Custom Orb, Trimwall or Multiclad. An extremely functional and strongly built carport. Like all the other carport designs, they are available for both non-cyclonic and cyclonic wind regions. A strong but simple design with SHS posts. Choice of roof pitches: 3 degrees or 5 degrees – custom if needed. Options available: footing plates to fix onto existing concrete/footings, upgrade of post size.